On October 27th, 2012 the unimaginable happened to our family: we lost our little boy, Richard Edwin-Ehmer Specht (Rees) to a drowning in our backyard pond. This page is dedicated to his memory, and our commitment to make the world a better place in his name. Help us help each other. Let’s all work together and do the small things that make a big difference. Our little Boy’s life was brief, but we hope to make his legacy eternal. We all possess the ability to do something Super: Respect each other, respect ourselves: ReesSpecht life. Our primary goal is to remind people the importance of Community, Compassion and Respect. We will strive to promote these ideals through a Memorial Scholarship and an awareness campaign featuring our Logo (Rees riding on his favorite thing: Tractors!). The primary way of accomplishing this is through “ReesSpecht Life Cards”. (Image right) We hand out the cards every time we perform an act of kindness. The hope is that each person in turn will then also carry out an act of kindness and a chain reaction will ensue. 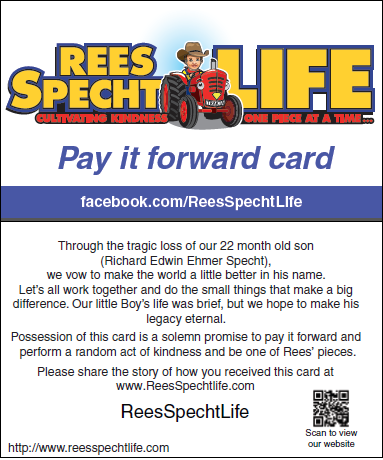 To this date over 240,000 ReesSpecht Life cards have been distributed. In a country that counts its population in the hundred millions 240,000 acts of kindness is only a start… but we believe we can make this world a better place, one Rees’ Piece at a time. To order cards click here. 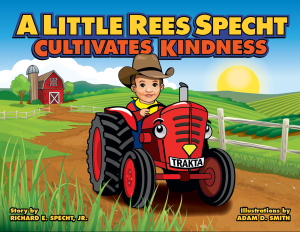 We are also proud to announce that in 2014 we published a Children’s book titled: “A Little Rees Specht Cultivates Kindess”. All proceeds from sales of the book will go to our scholarship fund. It is our goal to have a ReesSpecht Life scholarship in every High School that we can across the country. The money we raise through fundraisers and donations will be reinvested in our community to ensure these ideals are met. We can make a difference in this world, one piece at a time. Help us help each other. Help us respect each other, help us ReesSpecht life.